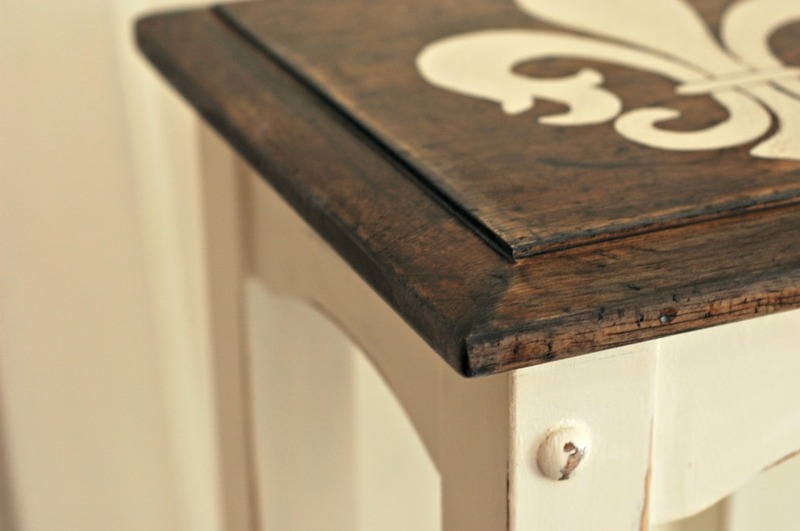 What if you could makeover your table to look like this? This makeover is pretty simple, you just need some time and patience! The first thing I did was sand the entire table with a coarse grit sandpaper to remove the varnish. Next, I wiped the whole table with a damp cloth with a drop of dish washing soap to remove dirt/oil and then followed up with another clean, damp cloth. Once dry, I used medium grit sandpaper to remove more varnish from the top of the table. Normally I would sand down to bare wood but I wanted some of the pigment from the original stain to show through on the final version so I stopped sanding about 3/4 of the way through. Because I was going with an aged/distressed look, I used a screwdriver and a hammer to bang some dents and pockmarks into the table top. I followed this up with a thorough sanding with a fine grit sandpaper (I used 400 and 800) to get a smooth surface. Finally I wiped the whole surface with a lint-free cloth to remove the sanding dust. 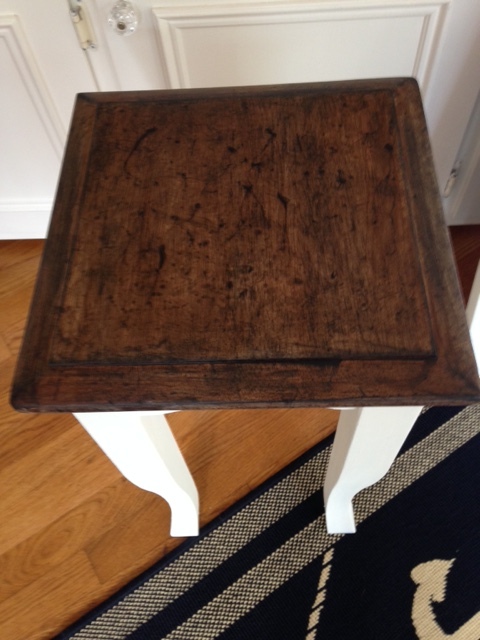 For the legs of the table, I tried a [new-to-me] homemade chalk paint recipe that I got from a tutorial on Lowe’s website. 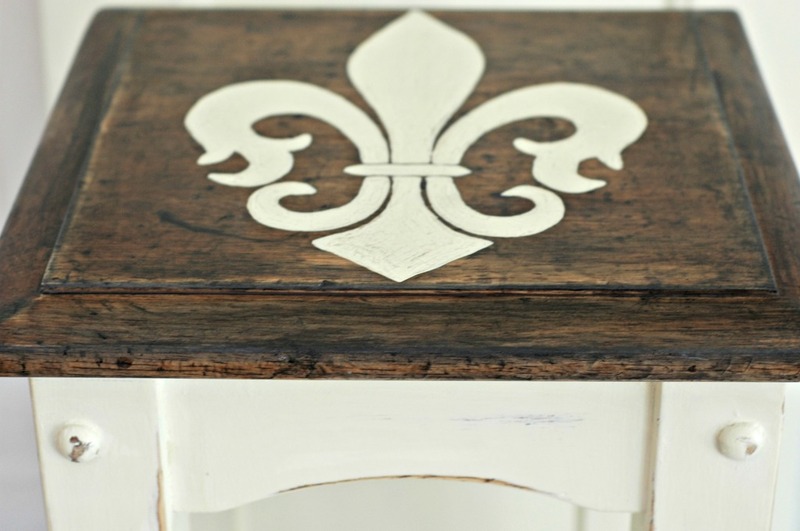 As you may recall, I had been making my own chalk paint with baking soda. I still like the baking soda method but now I am sold on using Plaster of Paris. It works basically the same as the baking soda method, however, I have found the paint mixture lasts longer which is a huge benefit. I painted the legs of the table with a white latex paint (flat works best) mixed with Plaster of Paris and water. I found the best measurements to be: 1 part water, 1 part Plaster of Paris and 3 parts latex paint (I like to mix this in a plastic cup because when it dries, it’s next to impossible to get it out of a container you plan to reuse for another project). The key is to mix the Plaster of Paris into WARM water before adding the paint. It’s genius really. I am hooked. After applying 3 coats of paint and allowing to dry overnight, I sanded the legs with medium grit sandpaper to distress the edges and to smooth out the Plaster of Paris. Next I used the leftover chalk paint to add a Fleur-de-lis to the top (I found the image online. 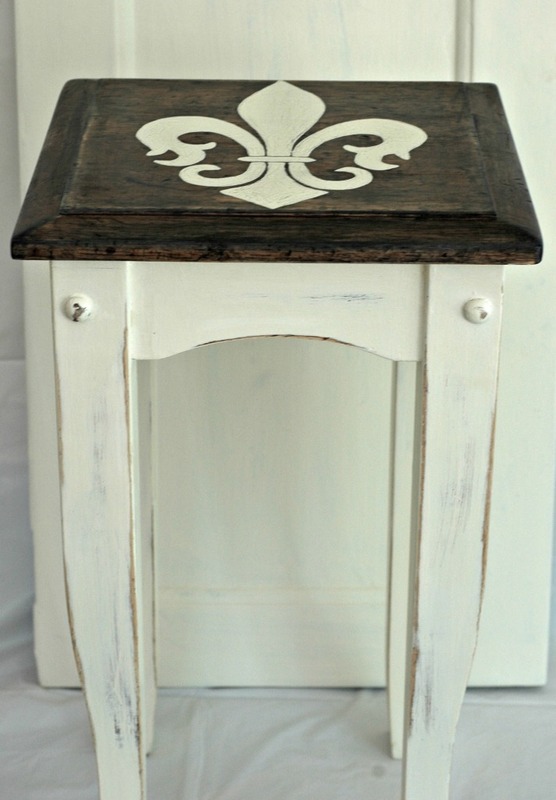 You can paint anything you’d like on the top. I just happen to love this decorative design). I’m not going to lie, painting this image was a painstaking process. I painted with artist’s brushes of varying sizes to follow the curves of the image I traced onto the table. 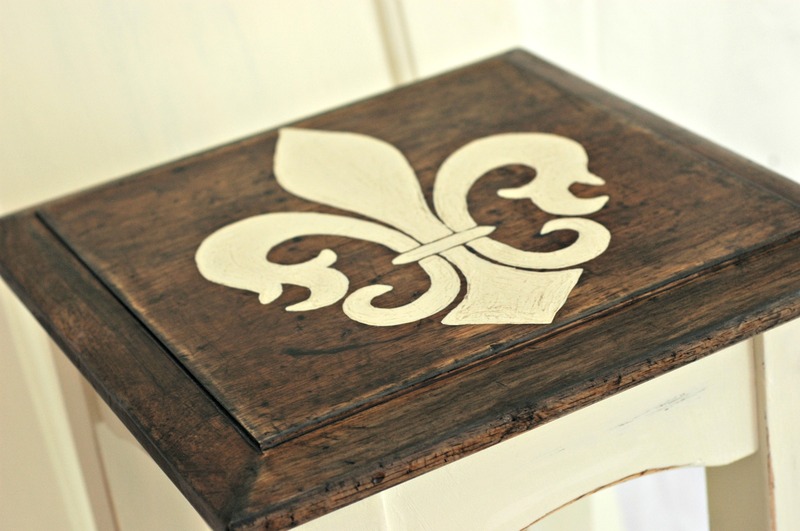 Did you see my last fleur-de-lis project? Kind of obsessed. Once it was dry, I dabbed a bit of white and black paint in various spots to further distress/age the piece and wiped it with a rag. 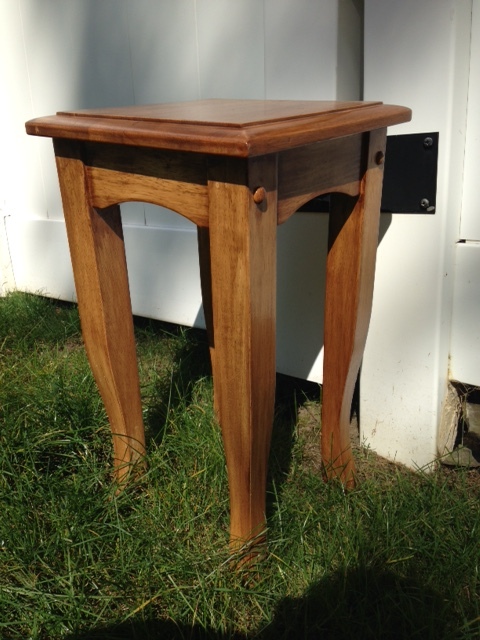 I sanded the top with 800 grit sandpaper and then applied water-based polyacrylic over the top and the legs. I applied 2 coats to protect the table. What do you think?